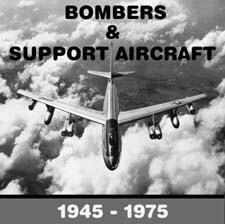 Boeing; 8-47 Stratojet, B-50 Superfortress, B-52 Stratofortress, C-97 Stratofortress, Cessna L-19 Bird Dog, T-37 Baby Jet. Convair; C-131 Samaritan, B-36 Peacemaker, B-58 Hustler, Curtiss C-46 Commando. De Havilland; U-1 Otter, U-6 Beaver. Douglas; C-47 Gooney Bird, C-117, Super DC-3, C-54 Skymaster, Grumman C-1A Trader, C-2A Greyhound, E-1 Tracer, OV-l Mohawk, S-2 Tracker. Lockheed; C-5A Galaxie, C-69, C-121, R7V (WV) Constellation (Warning Star), C-130 Hercules, AC-130 Spectre, C-140 Jetstar, C-141 Starlifter, P2V Neptune, P-3 Orion, S-3A Viking, SR-71 Blackbird, T-33 Shooting Star. Martin; P5M Mariln, B-57 Canberra. North American; OV-10 Bronco, T-28 Trojan, T-39 Sabreliner. (Bonus) Curtiss XP-55 Ascender.